After watching through all three seasons of HBO’s Silicon Valley, you probably feel like a member of Erlich Bachman’s cramped incubator. But how well do you really know his Silicon Valley home? 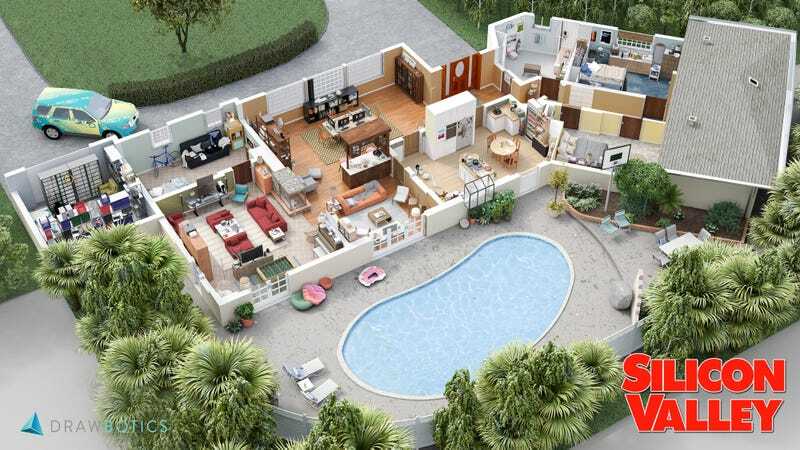 Drawbotics, a company that makes 3D real-estate visualizations, took some time to create detailed layouts of some fictional properties that only exist on TV. They didn’t skimp on the details, either. If you zoom in you’ll notice Jared’s camping cot set up in the home’s garage, Erlich’s Aviato-wrapped SUV in the driveway, and the giant server that powered the early version of Pied Piper. Even one of the most famous offices on TV—that of NBC’s The Office—gets a 3D treatment that includes Michael’s office and the vending machine-packed break room. They also tried their hand at Parks and Recreation, Mad Men, Brooklyn Nine-Nine, Suits, and the basement office dwellings of Roy, Maurice, and Jen of The IT Crowd. Here’s to hoping they tackle the immensely sprawling world of Westworld next, because, quite frankly, we’re still a little confused about what’s going on there.